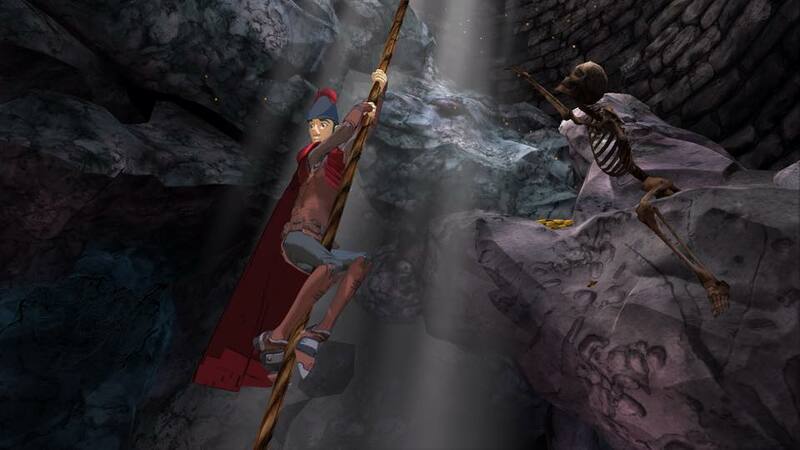 Two weeks ago we got our first King's Quest game in 17 years. I know revivals and reboots are all the rage these days, but this one struck me as really noteworthy. Sure, the likes of Wolfenstein, Doom, X-COM, and Syndicate have been given a new chance at life over the last few years. (Some successful, and some really, really not.) But those games were 90s properties, and you could see how they could be turned into something modern. It's one thing to take a game about turn-based shooting and turn it into a game about plain old regular shooting. It's another thing to try to breathe life into something as archaic as King's Quest, where its defining attributes are the very thing that killed the franchise off in the first place. It's like trying to reboot Batman in a world where everyone is sick of superheroes and dark visuals. No matter how you handle it, it's going to feel wrong. The King's Quest franchise began in 1983, which made it roughly contemporary with the original Atari 2600. It might be hard for youngsters to believe, but those massive pixels and 4 color images were actually pretty cutting edge at the time. I don't know if the technical excellence had anything to do with the eventual ubiquity of the series, but over the course of the next 15 years the series gave us a total of 8 games before the adventure genre "died" in the late 90s. 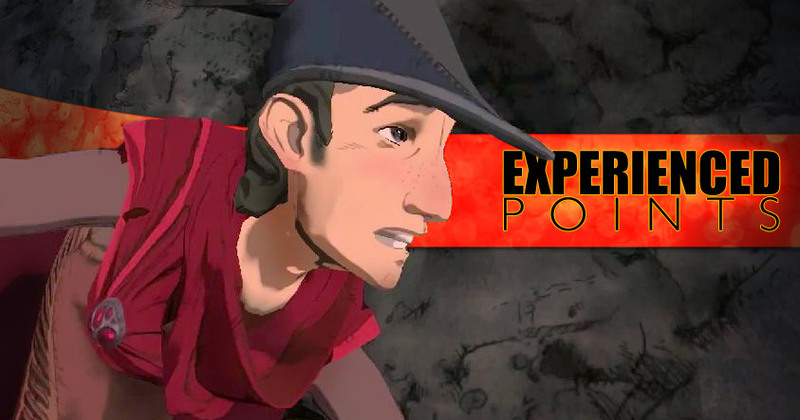 The King's Quest stories were a rapid-fire mixtape of fairytale tropes. We were a long way from scrolling backgrounds, so the world was divided into static screens that the player would navigate using the arrow keys. These screens were often vignettes of stories that the player was expected to be familiar with. Stories like Rumpelstiltskin, Hansel and Gretel, and Goldilocks and the Three Bears. 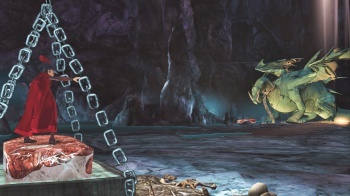 The gameplay was built around puzzles that focused mostly on gathering and combining items in unintuitive ways. The game expected you to experiment with the things you find but it also had a penchant for killing you for doing so. You'd walk into an area, attempt to take, push, or open some interesting thing, and die an abrupt death. Then you would reload the game and use what you just learned to inform your future attempts. There was no autosave, and you could often do things that would make progress impossible later, so you needed to maintain a meticulous library of saves. King's Quest wasn't the first adventure game by a long shot, but it became the most recognizable example of the form. It was technically advanced, even if other developers were doing more impressive things in an artistic sense. Adventure games were the dominant genre of the day, and King's Quest was the biggest name in it. Not everyone played it, but almost everyone that knew about videogames had heard of it. It embodied all of the aspects - both good and bad - of the genre it represented. Which means that King's Quest was sort of the Call of Duty of its time. I was never into King's Quest all that much. Sure, I played them - the third and fourth entries in particular - but I was more a fan of Space Quest, its sci-fi themed sibling. And when Monkey Island came out in 1990, I quickly lost patience with the trial-and-error gameplay of the various "Quest" games and went full-on Lucasarts fanboy. I never found the demise of the adventure game genre all that mysterious, particularly in the case of King's Quest. The games were charming enough, but plagued by lingering problems that nobody knew how to fix. A player in 1988 might be willing to slam their heads against a particularly egregious puzzle for days on end, when they don't have easy access to other games and no way to get the solution. But by the late 90s we had both Google and Gamestop, and by the 2000's we had GameFAQs and Steam. There was simply no incentive to put up with a game that was asking you to ignore the two dozen reasonable solutions to your current problem and painstakingly guess the one idiotic solution the designer envisioned. A reasonable person might ask why they didn't just tighten up the puzzles. The problem with that is that sensible and straightforward puzzles can't baffle players for days the way moon-logic absurdity can. If players solve puzzles faster, then they move through the game faster. If you don't want players to glide through your game in half an hour, then you'll need to add more content. Games like The Longest Journey took exactly this route. Unfortunately, this has the side-effect of making the game prohibitively more expensive to produce. Add in the fact that the turn of the century was right when game budgets began to get out of hand (which led us to the years where all the small arthouse developers began selling themselves to the major publishers) and it's clear that classic adventure games were simply unsustainable. Developers could either retain the same gameplay and watch their sales plummet, or they could streamline the game and go broke trying to keep up with the demands for content. And that's basically how things played out. But over the last few years the industry has gone back into the archives, looking for "new" ideas. Or at least, ideas that haven't been done recently. The graphics race isn't quite over, but it's gotten to the point where most people don't care who's currently winning. So now developers are looking to gameplay, novelty, and nostalgia to stand out. TellTale brought adventure games back as talky, character-driven affairs. Indies are having a go at bringing back the "item scavenger hunt" gameplay idea in various forms. But how do you reboot something like King's Quest? It held onto the obtuse puzzle and "LOL randumb death" long after the other contenders had retired those ideas. Anything that sticks to that formula will only appeal to die-hard fans, and anything that breaks from the formula won't feel like King's Quest. In the case of developer The Odd Gentlemen, they went for re-inventing the gameplay and then making up for it with loads of fanservice. "Hey! You remember that one character? Here he is in glorious 3D! And that magic object the series is built around! And that one thing with the dragon? You get to see that re-enacted in the tutorial! And we still title all the games using really terrible puns because we know you love that!" So it doesn't play anything like King's Quest, but it looks and sounds just how you would expect King's Quest to look and sound in 2015. Is it any good? I don't know. I find the mix of new and old to be really confusing, like a 2D platforming version of Uncharted. But it seems to be getting good reviews, and even diehard fans of the classics seem to like it. For me, I'm hoping the game does well because I'd like to see developers keep reviving classics and mixing the old with the new. The past had some great ideas that got left behind as trends and budgets funneled developers down one particular path. Now is a good time to circle back and check out those roads less traveled.